Around 50 people, including many mainstream environmental leaders, were arrested after they handcuffed themselves to the White House gate to protest any approval of the Keystone pipeline. As an administration decision on Keystone XL looms—Secretary of State John Kerry said last week it would come in the “near term”—the protests and civil disobedience in Washington are heating up once again. It’s hard to say that the initial postponement of the pipeline wasn’t a direct result of the protests outside the White House in summer 2011, which were the largest acts of civil disobedience undertaken by the environmental movement in decades and thrust the pipeline into the national spotlight. So it makes sense that the same crowd is back again to try to push the White House away from approval. A throng of at least 200 people gathered in Lafayette Park outside the White House on Wednesday morning, only about 12 hours after Obama had finished his State of the Union speech. (The president talked extensively about climate change, but did not mention the pipeline.) Speakers rallied up the crowd and portrayed the Keystone pipeline as a seminal moment in the environmental movement—something that was important not just because of the deleterious carbon emissions it will create, but also because stopping it has become a symbolic fight for the burgeoning environmental movement. “This is our Birmingham,” said Reverend Lennox Yearwood, president of the Hip Hop Caucus. The crowd at the gate included Bill McKibben, head of 350.org, the actress Daryl Hannah, Robert F. Kennedy, Jr., NASA Scientist James Hansen, Michael Brune, the Sierra Club’s executive director and Julian Bond, former head of the NAACP. Notably, this was the first time the Sierra Club engaged in civil disobedience in its 120-year history. The protest was smaller than last time, when over the course of several days over 1,000 people were arrested outside the White House. Another large-scale rally, with no arrests planned, is scheduled for this weekend. It’s even more crucial this time around for the movement to mobilize public support for rejecting the pipeline—there’s no election hanging over Obama’s head, and every indication so far is that the administration may be leaning towards approval. With respect to the Keystone, Secretary Clinton has put in place a very open and transparent process which I am trying to, committed to seeing through. I can guarantee you that it will be fair, and transparent, and accountable, and we hope that we will be able to be in a position to make an announcement in the near term. I don’t want to pin down precisely when, but I assure you in the near term. I’m not going to go into the merits of it here today. I pay great respect, as I did in my comments earlier, to the important energy relationship with Canada and the importance of the overall relationship. But we have a legitimate process that is underway, and I intend to honor that. Neither of these comments are encouraging for pipeline opponents. I read both as prepping the public for approval. They respectively cite the accession of the Nebraska governor and the “important energy relationship” with Canada, without any acknowledgment of the huge environmental implications. The Keystone protestors certainly have their work cut out for them. 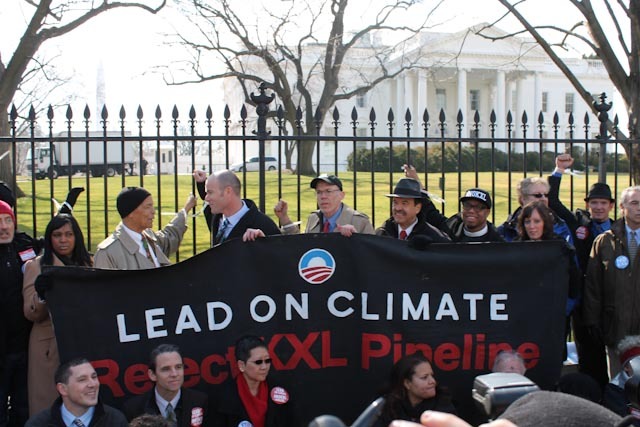 Read Michael Klare's take on the importance of the Keystone battle.